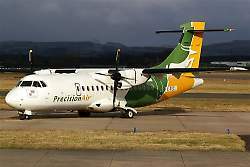 Precision Air has confirmed that the airline has on Wednesday this week resumed operations to Kigoma, a town located on the shores of Lake Tanganyika. The airline is using an ATR 42 for the service, which now operates 5 times a week, originating in Dar es Salaam and routing via Mwanza every Monday, Wednesday, Friday, Saturday, and Sunday. Flying time from Mwanza, a city located on the shores of Lake Victoria, to Kigoma, the main municipality on Lake Tanganyika, is approximately 1 hour and 10 minutes. The new scheduled service is considered to be of crucial importance to the business community in Kigoma but also expected to help in opening up Lake Tanganyika for tourists in a part of Western Tanzania which sees only a fraction of the overall tourists visiting the country�s traditional heavy weight national parks and attractions. Precision Air is Tanzania�s premier airline, offering the widest domestic network and a growing number of destinations in the region and beyond on the African continent. The airline presently has 14 aircraft on their fleet and an additional order of ATR42 -600 and ATR72-600 state-of-the-art turboprop aircraft pending with the French aircraft manufacturer. Besides the ATR fleet, Precision Air operates 3 B737-300 jets for flights to Nairobi, Lubumbashi, Lusaka, Johannesburg, and the key domestic route between Dar es Salaam, Kilimanjaro, and Mwanza.